Today, an old photo that was submitted and printed in The Graphic, Portland, Indiana, in 1954. 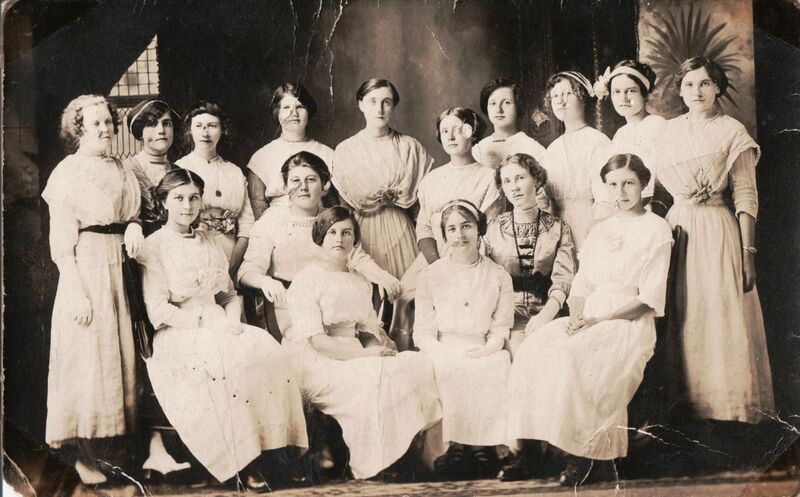 The photo was originally taken in 1914 of Edna Brewster’s Mount Carmel EUB Church Sunday School class. 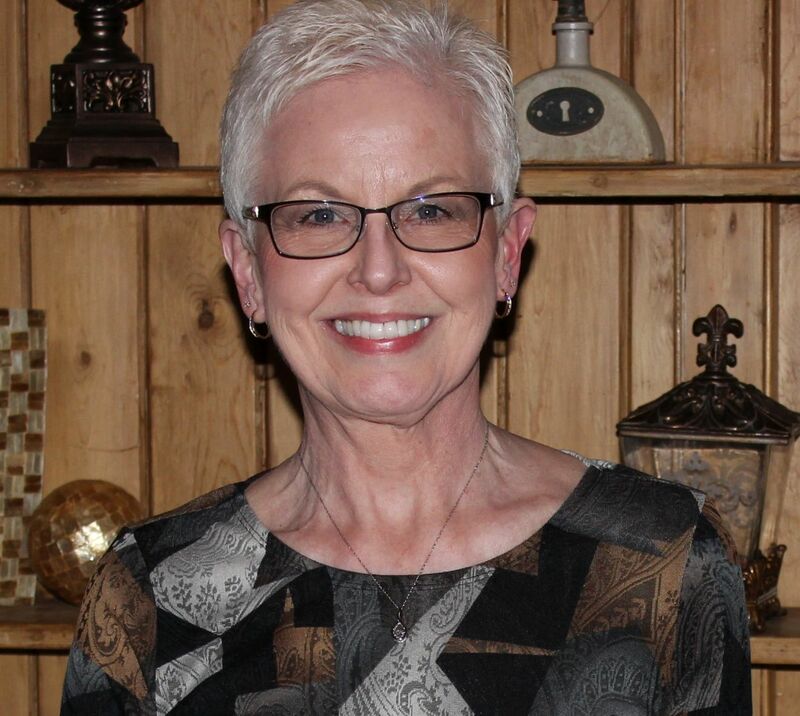 The church was located in Jefferson Township, Adams County, Indiana. The Graphic had a feature section “From the Old Album” where people could submit an old photo with a description and maybe even a little bit of history. 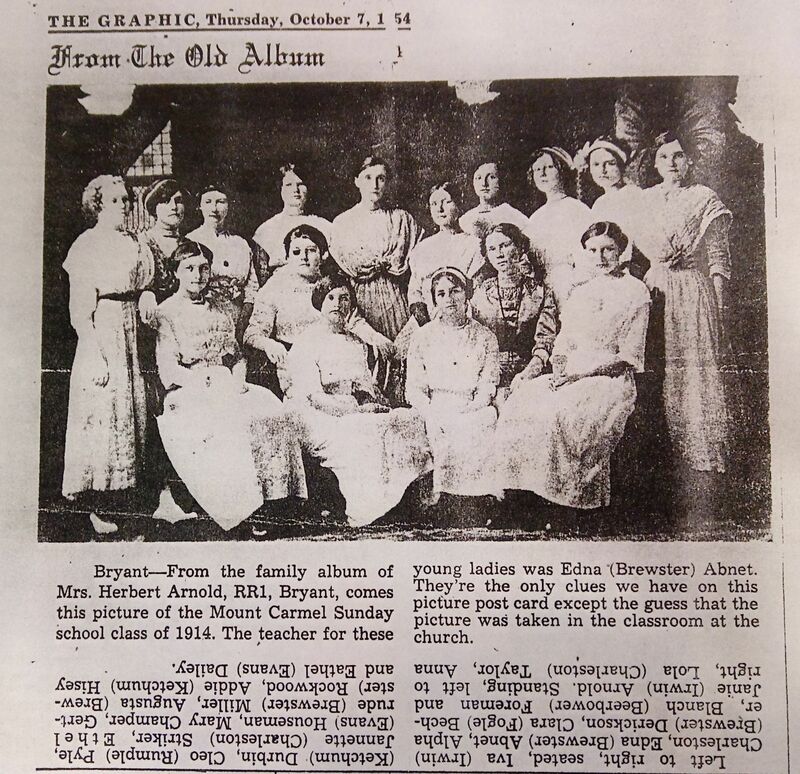 My grandmother Gertrude (Brewster) Miller (1896-1973) and her sister Alpha (Brewster) Derickson (1898-1968) are among the young ladies pictured in the photo below. The girls are all dressed in white, in their finest Sunday dresses. It looks like it was a special occasion. I wonder what what the occasion could have been. Bryant—From the family album of Mrs. Herbert Arnold, RR1, Bryant, comes this picture of the Mount Carmel Sunday school class of 1914. The teacher for these young ladies was Edna (Brewster) Abnet. They’re the only clues we have on this picture post card except the guess that the picture was taken in the classroom at the church. Mt Carmel Sunday School Class, 1914; postcard held by Karen. Seated, left to right: Iva (Irwin) Charleston, Edna (Brewster) Abnet, Alpha (Brewster) Derickson, Clara (Fogle) Becher, Blanch (Beerbower) Foreman, and Janie (Irwin) Arnold. 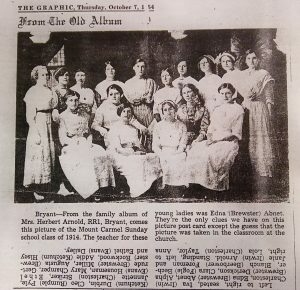 Standing, left to right: Lola (Charleston) Taylor, Anna (Ketchum) Durbin, Cleo (Rumple) Pyle, Jannette (Charleston) Striker, Ethel (Evans) Houseman, Mary Champer, Gertrude (Brewster) Miller, Augusta (Brewster) Rockwood, Addie (Ketchum) Hisey, and Eathel (Evans) Dailey. Interesting that the paper printed the girls’ names up-side-down, making the reader try to guess who they are. In addition to my grandmother Gertrude and my great-aunt Alpha, a couple of the other names sound familiar. It turns out I have run across some of the names before. Edna (Brewster) Abnet, the teacher, was Dora Edna Brewster (1892-1967), daughter of Daniel and Mary Loverda (Bebout) Brewster. Edna was my grandma Gertrude’s aunt and Edna’s father Daniel Brewster was my great-great-grandfather. Edna Brewster married Charles Calvin Abnet (1879-1960) and they had a son Don, who married Ruth E. Luginbill. Augusta Blanch (Brewster) Rockwood (1897-1965) was the daughter of Daniel and Mary Loverda (Bebout) Brewster and a sister of Edna Brewster, the teacher. Augusta married Dale Henry Rockwood (1895-1965) and they had four children: Loverda (1915-1994), George Henry (1917-1920), Delno (1919-1985), and Veryl (1921-1998). Clara (Fogle) Becher (1899-1980) was Clara Catharine Fogle, daughter of Samuel J. and Ida C. (Booher) Fogle. She married Clarence Oliver Rehman “Raymond” Becher (1897-1956) in 1918. Raymond was the son of Jacob and Mary (Kettering) Becher. The Bechers attended Zion Chatt at one time. My great aunt Alpha Ethel Brewster married Ralph Derickson (1894-1981) and they had children Pauline, Ruby, Elva, Ralph Jr, Alvin, and Paul. Ralph Jr was killed in Germany in 1945 during WWII. Mount Carmel Church was a frame structure in rural Jefferson Township. It had a Geneva address and was located about two miles across the state line, about 4-5 southwest of Chatt. So it was not really all that far from Chatt. Google Maps indicates the address of the church was E 900 S, S 450 E. Back then it was an Evangelical United Brethren church (EUB), which is now United Methodist. According to his obituary, Gertrude’s father Philip Brewster was a janitor at the Mount Carmel Church for many years. This is the second family-related photo I have seen in “From the Old Album.” The other is a wonderful five-generation photo that also includes some good family history information. My grandmother Gertrude is also in the photo below. She is the little girl and the photo was probably taken about 1898. I appreciate that copies of both articles were saved by someone in our family. Five Generation Photo, Cottrell, Headington, Reid, Brewster; The Graphic, 18 April 1957. 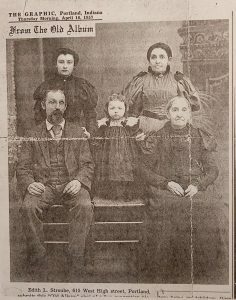 My ancestors in the photo above: William Reid, Gertrude (Brewster) Miller, Mary Ann (Cottrel) Headington, Pearl (Reid) Brewster, and Elvira (Headington) Reid. I have written about this photo before. I sure recognize those. I have a few of the old record books from Mt. Carmel from the 1800’s and early 1900’s. We had a lot of good times. We were members there until it closed. I recited my catechism there under the postorate of Wesley Bullis. I bet you do! Do you remember most of them? Some of the later Mount Carmel church records are on Ancestry and I was looking through them when I wrote this post. I noticed that Rev. Delbert Cress was there for awhile. I was in his wife Juanita’s algebra and geometry classes in high school. Small world! Thanks for writing.